LE PHO | Geringer Art, Ltd. Le Pho was born in Viet Nam on August 2, 1907. He was tenth child in a family of twenty fathered by the senior mandarin Le Hoan. Because of his father’s status he received a cultured education, including training in brush painting. Le Hoan was suspected for many years to have been a front man for the French Colonialists, and may have taken part in suppressing a peasant uprising led by De Tham. Although recent records appear to vindicate Le Hoan, Le Pho’s early life was colored by these events. Le Pho, at age 18 became a member of the first class of students to attend the French sponsored Ecole des Beaux-Arts in Hanoi in 1925. The Hanoi ecole was directed by Victor Tardieu who had been a classmate of Henri Matisse in the Atelier Moreau. 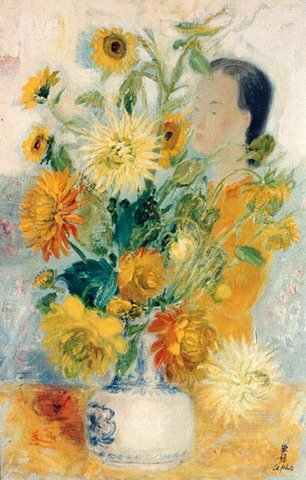 In 1930 Le Pho left for Paris, where he studied painting for two years. During the 30’s and early 40’s he painted with long, thin brushes using watercolor on silk. His subjects, including bamboo, birds and lotus flowers were traditionally Asian. Upon returing to Hanoi in 1933 he was made a professor at theEcole des Beaux-Arts, a position that he held from 1933 to 1936. His students from that era remember him as a thin, polite, and well-kept. He returned to Paris in 1937 to serve as a delegate to the International Exposition, and also as a jury member. Pho remained in France, and had his first one man show there in 1938. He became an advisor to the Vietnamese Embassy in Paris and regularly exhibited at the Salon des Independants. In 1946, together with Tran Duc Thao and Tran Huu Tuoc, he provided assistance to President Ho Chi Minh and Pharn Van Dong during their stay in Paris. In the 1950’s after Le Pho absorbed the influence of Pierre Bonnard and Odilon Redon, his subjects included sensual female figures, often portrayed in interior settings. His best paintings, on silk and canvas, are gentle, poetic and Asian in their aesthetic approach. Because of his exquisite skill and his influence as a teacher, Le Pho’s paintings are considered extremely desireable. Le Pho died in Paris in 2001, after donating 20 of his works to the Viet Nam Museum of Fine Arts.